Acca Edge is a fantastic offer for both new and existing Betfair customers. It is their version of Acca Insurance but acca edge works a bit differently to the other offers. Money back on your acca if only 1 team lets you down. Cash refunds rather than the free bets that other sites give you. No max refunds. Other sites have refunds capped at £25 or £50. Acca Edge applies to trebles and above. Other sites need at least 5 or 6 teams to qualify. Available on Football Accumulators and Both Teams to Score Accumulators. Looking for something to use Acca Edge with? Check out the latest football accumulator tips from Football Bet Profit! These benefits are fantastic, you’re probably wondering why you’d go anywhere else! Betfair Acca Edge comes with a catch though. To use the offer, you have to accept a reduction in odds and get less returns for your money if the bet does win. 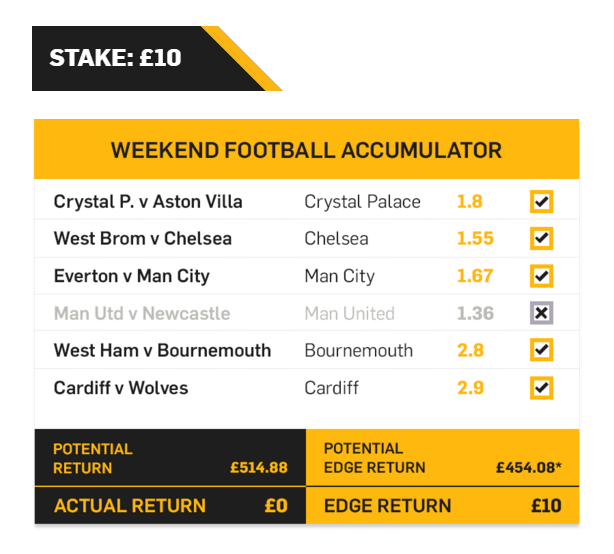 Because of this, Acca Edge is best used for very safe bets with large stakes to make the most of the offer. Full details of Acca Edge can be found below. Don’t have a Betfair account yet? Get £20 free here for signing up and depositing just £10 – repeatable 5 times for £100 free! Start using Acca Edge now! Acca Edge is applicable on any sport and selections from different sports can be mixed. Refunds are given as cash, not a free bet. Pre-match bets only, in-play bets will not count. Acca Edge accumulators must contain 3 or more teams to qualify. To Use Acca Edge you need to opt-in when you place your bet. Odds will be reduced if you choose Acca Edge. Acca Edge is not available if you’re placing your bet using a free bet. If one of your selections is voided Acca Edge gets voided and your bet reverts to the price before Acca Edge was applied. If you cash out, the bet gets settled for the Cash Out amount and any further Acca Edge payment is void. The chance of Acca Edge applying is factored into your Cash Out offer. Above is an example of what happens when you edge your acca with Betfair. A £10 stake on these 6 selections would return about £60 less if you edge your acca but as only 1 selection lost – your stake would be refunded in cash immediately. Acca Edge is just one of the many offers that make Betfair one of the best sites to be using. They also offer £100 in free bets for new customers and fantastic offers like the Betfair Price Rush. You’ve read our Betfair Acca Edge review, but we’d love to hear what you think of this offer!